s anterior), a medial scalene (scalenus medius), and a posterior scalene (scalenus posterior). They derive their name from the Greek word skalenos and the later Latin scalenus meaning “uneven”, similar to the scalene triangle in mathematics, which has all sides of unequal length. These muscles not only have different lengths but also considerable variety in their attachments and fiber arrangements. 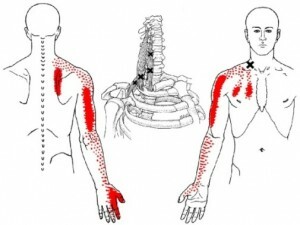 As you will see from the descriptions below, these muscles are in a very crowded place and are related to many important structures such as nerves and arteries that run through the neck. The scalene muscles are three paired muscles of the neck, located in the front on either side of the throat, just lateral to the sternocleidomastoid. The disorders caused by TOS are not well understood. Yet, it is known that when the blood vessels and/or nerves in the tight passageway of the thoracic outlet are abnormally compressed, they become irritated and can cause TOS. 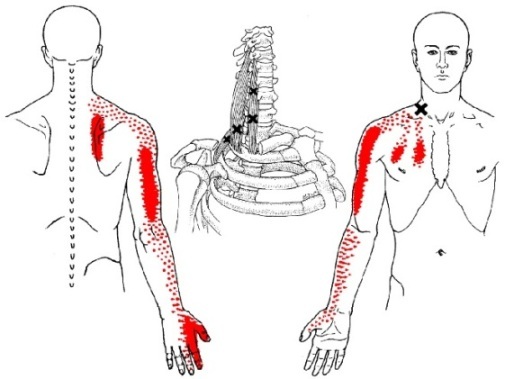 Thoracic outlet syndrome can be a result of an extra first rib (cervical rib) or an old fracture of the clavicle (collarbone) that reduces the space for the vessels and nerves. Bony and soft tissue abnormalities are among the many other causes of TOS.